In the Dark Fantastic age, a sorcerers home literally is his castle. From the storm-blasted halls of mighty Doissetep to the craggy reaches of Portus Cruis, from the wagons of the Lickspittle Players to the ornate majesty of the White Tower of Langudoc, the Awakened cast their spells, gather their minions and secure their power. Shall Breach These Walls While I Yet Live! Castles and Covenants is a packed guide to strongholds, the magi who reside there, and the ins-and-outs of castle life in the Dark Fantastic world of Mage: The Sorcerers Crusade. This book is a must-have for starting chronicles, not simply because it allows players to design a fortress-home for their characters, but because it is the foundation for every battlement and keep that mages will ever stand atop or face in the fury of battle. 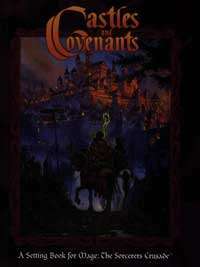 Why is this, and a number of other Sorceres Crusade books, not available as physcial copies?